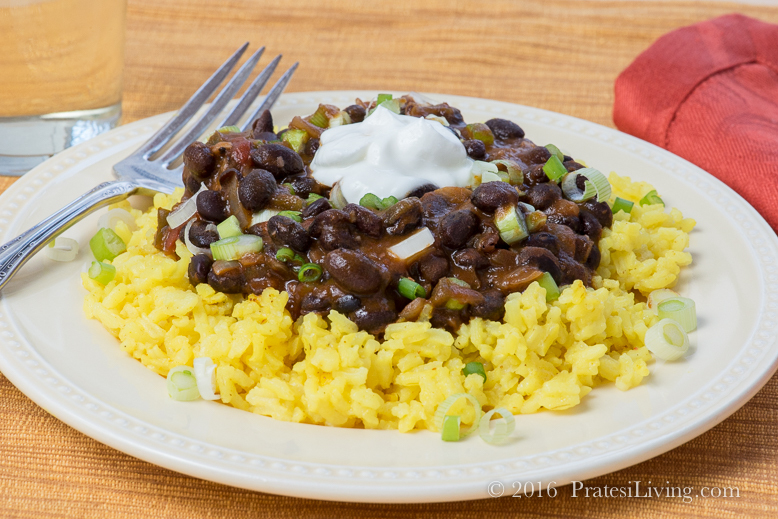 Vegetarian, simple, and it tastes like a dish that took a lot more time and effort to prepare…Black Beans and Yellow Rice is one of our favorite weeknight dinners. Now that Mother Nature has finally decided to kick winter into high gear, it’s nice to have dishes that can be prepared with basic pantry items so you’re not running to the grocery store in a panic over a potential snow or ice storm scrambling to grab something for dinner (and the proverbial bread and milk). This recipe is one that you’ll be glad to add to your list of quick and easy dinners. And if you keep the ingredients on hand (and I think most of us do), you can make it in a pinch. If you’re like us, we want to add more bean and plant based dishes to our usual menu planning. Black beans are a great source of protein, especially when paired with rice. And this dish is hearty enough that you’ll feel satisfied without having any animal protein. The beans have great flavor and are prepared by first sautéing onions, green pepper, and garlic in olive oil and then you add in canned black beans, stewed tomatoes, tomato sauce, and a few seasonings and simmer for about 1 ½ hours. Serve the beans with either homemade yellow rice (or one of the brands that has the seasonings added in) and top each serving with sour cream and chopped green onions, which give a nice fresh taste and a little crunch to the dish. If you prefer your black beans spicy, add in a few dashes of hot sauce. It’s hard to believe that I’ve been making this recipe for 30 years and still enjoy it. Of course, feel free to add more spices, cilantro, freshly squeezed lime juice, or any other ingredients to your taste. You could also add sliced and cooked Cajun sausage, if you prefer a dish with meat. Sometimes I also top the beans with grated cheddar cheese along with the sour cream and green onions. In a medium Dutch oven over medium-high heat, heat olive oil until hot but not smoking. Add onion, green pepper, and garlic. Lower heat and cook over medium heat until vegetables are translucent. Add beans, stewed tomatoes, water, tomato sauce, red wine vinegar, sugar, black pepper and salt; combine well and bring mixture to a boil. Cover, reduce heat, and simmer 1 hour. Uncover and simmer an additional 20 to 30 minutes, stirring ocassionally. 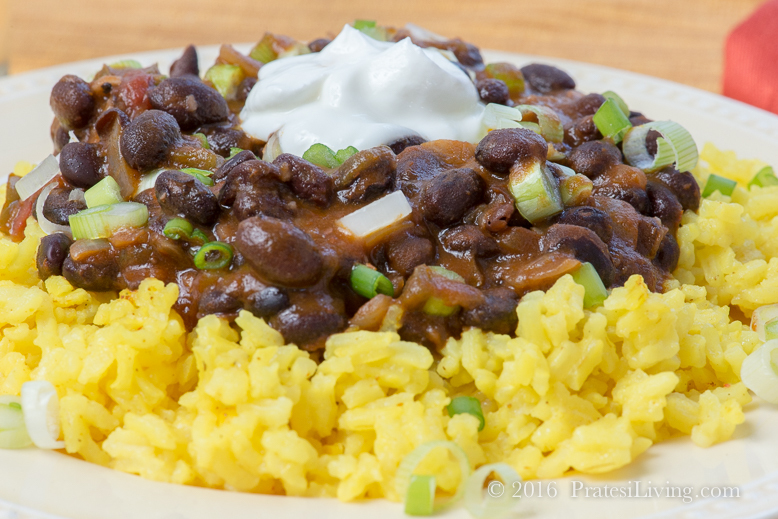 Serve black beans over hot cooked yellow rice and top each serving with a dollop of sour cream and chopped green onions.